Guitarist and singer whose career that spanned more than six decades as a blues artist but along the way had one vital rock release that offered tantalizing hints that had he come of age in another time he might’ve enjoyed a far more fruitful career than the vagabond life of a minor bluesman he endured. Thomas was born in Louisiana in 1911 and in 1929 at the age of 18 he recorded his first sides for RCA-Victor backing blues singer Bessie Tucker on four songs and cutting four songs of his own that came out over the next two years. Two months later he was back in the studio behind Tucker for two more sessions and the interest he’d elicited from a major label at such a young age must’ve made it seem as though he was on the verge of a breakthrough. It wasn’t to be as he then went almost twenty years without another shot at recording. Though the musical landscape had changed dramatically over those two decades, with jazz and all of its off-shoots having moved that form of black music into the mainstream, Thomas stuck with the blues, though he now was performing with an electric guitar rather than acoustic. His output was certainly decent, his songs themselves were interesting and well-crafted featuring solid vocals and sparse stinging guitar-work, but on small labels such as Miltone and Club they had little chance of becoming hits. On the latter, a start-up label for whom he had their initial releases, he also backed gospel artist Sister Rosetta Wynn, giving another clue as to his versatility that would soon be explored further, albeit in a different style altogether. It was his one release that followed on Freedom Records in 1949 when he was backed by The Hep-Cats, the studio band who were establishing themselves as one of the tightest rock bands in existence, where Thomas followed their lead and showed how suited he may have been for rock. More likely it was a case he was letting them pull him into what they did best, though he proved himself comfortable enough to do so, but at 38 years old he was a bluesman at heart who wasn’t about to permanently change direction now to chase hits. Even the B-side, “Guess I’ll Walk Alone”, a melancholy ballad had great promise and featured mournful sax work that pulled it towards inextricably towards rock but by the latter half Thomas’s voice started shading it with a blues tint that made the point moot. Since it was a one shot deal with Freedom they didn’t have another chance to work on making a full transition to rock and as a result he remains a tantalizing “what-if”. His work over the next decade and a half was sporadic, usually coming on smaller labels and then only one or two releases before moving on, but it was usually quite good. He proved himself to be quite versatile within the blues idiom, his work ranging from an uptown blues style when working with pianist Lloyd Glenn on Swing Time in 1951 to a more urbane sound when backed by the great Maxwell Davis on Specialty later that same year. In the mid 1950’s on Hollywood Records, he veered closer to the hybrid sound of Guitar Slim, another bluesman who seemed a possible fit in rock ‘n’ roll and yet never could fully give himself over to it in order to find out. Yet Thomas’s “Cool Kind Lover” from 1956 with its solid sax solo, steady backbeat and a theme which might’ve been applicable for the rock audience came closest of all his work from that decade. Ironically it might’ve been when he hooked up with another former Freedom Records artist from 1949 in L.C. 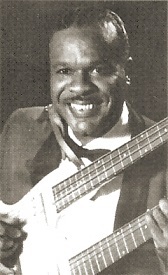 Williams, that Jesse Thomas headed back into a sound that was more adaptable for rock, as his work on “When I Squeeze Your Hand” and “Take Me Back Baby” from 1962 on the tiny RTA Victory label approached the outskirts of rock without crossing the threshold. He made a few records with female vocalist Jerri (Jerry Ann) Wilson for the Louisiana label Red River in the mid-60’s which were tangentially connected to rock but by this time however Thomas was past fifty years old and quite comfortable as an itinerant bluesman and as such he continued playing that music for the rest of his life, dying in 1995. Never a star in any field, but with a worthy catalog that spoke well of his skills as a vocalist, guitarist and composer, as well as showing him to be versatile enough to have a continuous career in music his entire adult life, but it was his brief flirtation with rock ‘n’ roll that provided his best shot at glory.